I woke up at 4.45am. The day of the race! I knew I had to eat breakfast, but my stomach was saying no thanks. I didn’t feel nervous really, just wanted to get going! So I forced myself to eat something small and light, and drank some water. Two of the most important things to get right are you hydration and nutrition, not only before during training, but also on race day. To do this you need to practice during training to find out what works for you and I was hoping I had that sorted. My plan was in place, I loaded my GU chomps into my back pocket, all packaged into 5 equal portions. Another thing you need to watch out for on long, sweaty runs is chafing! This can debilitate you terribly. I have worked out that although Glide is far more friendly on the clothes (does not stain) it does not last for the long distances, so Vaseline it was. All lubed up and ready to go. Geoff drove me down to the start, and we managed to get a park quite close. It was still dark and there were so many people milling about. I found my pace group for 4hr30 and then of course I needed to go to the toilet (as you do). The queues were loooooong, and I stood there starting to panic I would not get to the start before the horn went off. 5 mins to start time and I was back waiting to run! 6.10am and we’re off, or at least the people in front are! We walk…..and finally get over the start line. At this point I am realizing that I do not have enough Vaseline smeared on myself, so am hoping there will be some along the way. The run starts well, there are hilly bits for most of the first half, but I am feeling good as I have done lots of hills in training. 2 kilometers into the race and my lower left calf starts to hurt, and it twinged and pulled all the way to 29K! I knew it wasn’t my Achilles, so at least I could push through, and as long as I stretched at each aid station I would be okay. By the time I reached the bottom of the bridge I was still feeling fresh and apart from my calf, everything else was good. I had found a Vaseline angel at the previous aid station and proceeded to amuse everyone there with my antics while anointing myself on the run. There were Japanese drummers at the bottom of the incline, banging away and that helped with getting the motivation for the climb. I must say, the climb felt like a breeze, but I did not have a look around at the view as when I run, I tend to look along the road. Then I crested the top and off I went down the other side, and as I turned into the off ramp, the leader of the half marathon came flying past. So at least I made it over the bridge before that! By the half way point I had lost my pace group. I was running a bit slower, and it did not worry me at all. I am normally so competitive, against myself and also others, but it didn’t matter. I knew I had to just keep going. My friend Heidi said to me when it gets tough to dedicate each kilometer to someone and why I was picking that person, so I used that from then on. 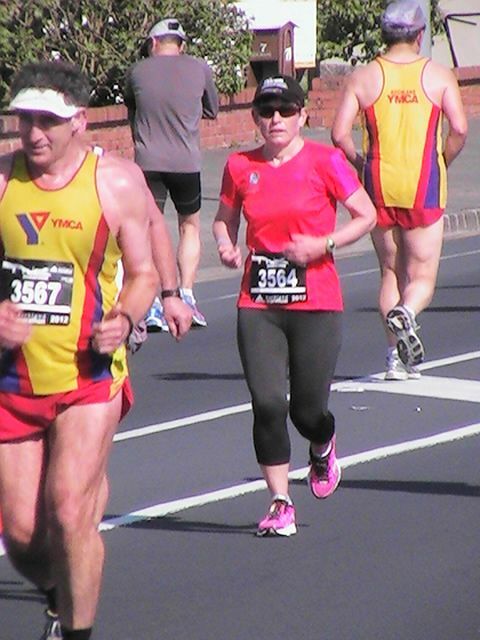 I ran for my first husband, who had a brain tumour and passed away at 37. I said to myself that the pain I was feeling was nothing like his had been. And it got me through! At 29K or so, Geoff was waiting and he jogged along with me for about 2 minutes. 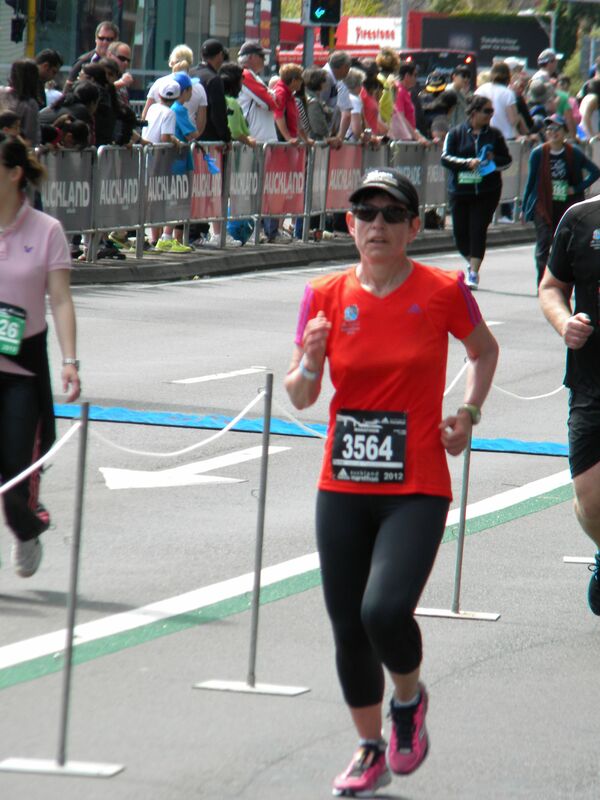 This was on Tamaki Drive, and as the race wound round the bays, all you could see were runners snaking along around the corner, into the distance. Each time I rounded the same corner, there in the distance was another one! Finally I reached the turnaround, and then it was 32K and I was in uncharted territory. I had never run longer. 34K came and I celebrated! “Yes! Only 8K left!” I cheered to myself. And 1 second later both my feet started to hurt like I had never felt before! I think this was the part of the race where I really had to talk to myself. I just kept pushing myself on, reminding myself to use my arms to get me through. I didn’t do all that strength training for nothing and arms can pull sore legs along because when you pump your arms, your legs have to follow. This got me through to 40K and I decided to test my reserves. So I sped up and to my delight, I still had gas in my tank. So I started running past people and finally turned the corner to the finish. There it was, like a beacon in the dark! I powered towards it and flew over the finish line! (Or at least I thought I did, and it felt like it) It was over! I had done it! I got a drink of water, some Powerade and a banana, and had all three while I wandered around, found Geoff and my daughter Kerry, got my medal, and nursed my sore foot! As I sit here eating chocolate, feeling all righteous about the massive amount of exercise I have just done, it is easy to forget all the hard work that went into maintaining a well functioning body during all that training. The problem is I am hungry, but I just couldn’t be fuzzed to put the effort into preparing a proper meal. I think I am tired…. But I digress, and jump ahead of myself. This morning I sat down and typed up a long account of the day before the race and the day of the race, uploaded a whole lot of photos into the page, pressed publish and it all vanished into the ether. I was mad! I then had to go in to work so could not and did not fell like rewriting the entire post again. So I am back at the computer now, a few hours later, and my format ideas have changed….I shall break it down into three posts. In feel this is a better way to communicate what happened to me over the last three days. This post is about the day before the race. I had woken up early, on purpose to get used to the early rising time. For me this is nothing new as I am often up early, either to fit my run in before work, or to head off to train early morning clients. I think it is very important to get used to running early if your race is early as it gets the body and mind into the correct space for race day. I was in two minds as to whether I should go for the recommended 3K ‘do my legs still work’ jog. I was still feeling a little off colour having the dregs of that cold I succumbed to the week before. After humming and ha-ing for a bit I decided I would do it and set off for a run that lasted 17 minutes before I gave up on the home stretch as I started to get a chafe! Anyway, at least I proved my legs still worked. We left home a little ahead of schedule, which was good as I wanted to get to our B&B, find somewhere for lunch and then put my feet up. We arrived in Auckland and went straight to the Expo so I could pick up my race number and goodie bag and have a look around. I had thought I would feel some excitement, but all I wanted to do was get out of there and to our accommodation. So we didn’t hang around much and went to check in. After that we went to find a place that served pasta for lunch. Now, there are many bits of info out there about pre-race fueling One tidbit I decided to follow was to rather have a big pasta lunch instead of the traditional dinner, that way avoiding a too full feeling on going to bed and perhaps bloaty in the morning. I am certainly glad I did that and would recommend it as a strategy. That night I just had a grilled chicken burger with some kumara fries from Burger Fuel and I slept like a baby! The afternoon passed in a really strange way…I found it really hard to sit still, I had periods of total quite, which for me is weird as I like to talk, and I just didn’t want to to talk. I didn’t feel nervous though, the nervousness had disappeared. I had my plan all sorted for the race – hydration, fuel, what to do if I felt it was too tough, made sure I had put everything out for the morning, set two alarms – another tidbit I gleaned from somewhere (interestingly, the winner of the half marathon had overslept and got to his start after the gun went off!). So everything was organised and at 8.30pm I went to bed, only to be woken up at somewhere around midnight by some idiots saying goodbye loudly to their friends in the street! However, I was so calm by then (very strange for me….maybe I was like a possum in the headlights….) that I went back to sleep and slept soundly until 4.45am, before both alarms went off. And so it was the day of the race…. Well, the time has come to head off up to Auckland and run this marathon! Last night I had the worst sleep ever, and it was supposed to be a good one. I went to bed with a horrendous headache that appeared out of nowhere and had to get up a few hours later to take a neurofen, something I have not done in months! It did get rid of the headache, which does not seem to be there this morning, so that is a positive. My cat was also being a nuisance throughout the night. She decided grooming was in order at 3.30am and when she does that her teeth squeak So squeak squeak squeak she went and then she thought some water was in order so hopped off the bed and went to the bathroom door and started scratching on it for someone to open it so she could get to her bowl. The only thing I opened was my sock drawer to extract a pair of socks which I then hurled in the general direction of the door. She got the hint…. Needless to say, when the alarm went off at 5am I was in no mood to do my 3K jog suggested in my training schedule, my body was saying no way! My mind was trying to convince me that I must, but for once I have listened to my body! This whole training journey has been an exercise in learning to listen to my body, and if I never do another marathon again, I have gained some insight into how I function within my mind, and how I need to sit back and chill and listen to that small voice that is my body! So saying…..tomorrow the mind must carry me through the final journey of this marathon adventure. I plan to take in the scenery as much as I can, and enjoy the race. I plan to walk through all the support stations to make sure I get all my fluids in and not on me, and give my legs a short break from running. I plan to smile as much as possible. The forecast is for rain, but according to http://www.metvuw.com/forecast this will not be happening until after I plan to finish the race. As I write this my nerves are building. I feel like I am typing faster than normal and my fingers are shaky. I can remember the first time I ran a half, I felt the same. I was worried that I would not make the distance, and I did it. So I know I will do this….I am just a little scared by the whole idea! Will I be able to walk on Monday? This is the question I am asking myself today. The nerves are finally starting to make themselves known. The excitement has given way to a certain level of apprehension at my ability to run this race. Body parts are starting to hurt, today it is my big toe and my lower back. I know from reading many articles that this is normal, and I know from my own experience when doing half marathons, that in the final week I always get these twinges, some of them quite severe! However, I am still, in that illogical place in my mind, thinking I have something wrong. The other thing that is playing with my head is the whole process of carb loading. I am feeling bloated and fat, and it is only day one. I haven’t really changed much in the way I am eating, just added a little high quality carbs to my meals, and removed some fat. With this I need to drink more water and I am struggling to keep this up. On top of all of this I am not running as much this week, and consequently am feeling lazy and even more fat! I am not the sort of person who can sit still for long so am finding this very challenging. 5 days left to the big event! Today is a public holiday. I am going to spend the day trying to relax and take my mind off the panic that is starting to bubble just beneath the surface of my calm exterior appearance. I have lots of nutritional material to read, so that will help with the carbo loading phase I am about to enter. It all feels a little surreal at this point. From the day I decided to do this race until today, 5 days before the race, it seems as if no time has passed and that it was yesterday I entered. Where have all those months of training gone? It is the strangest feeling, as if at the edge of the mountain looking down a long slope, seeing the start at the bottom and knowing I have to climb out the other side to get to the finish line. Stage two….up and over the bridge which has a length of 1,020 m (3,348 ft), with a main span of 243.8 m, rising 43.27 m above high water. Final stage up and over the small road bridge which will feel like Mt Everest at that stage (speaking from experience as I ran over it, into a headwind, during my 25K run a few weekends ago) and then stagger the last few k’s to the finish line. I am not planning to do one of my speed-up-and-charge-over-the-line finishes this time, but if I have the energy I will definitely give it a go. As I write all this I can feel my pulse rate increase as the nerves start to creep up on me again. All I can say at this point is I am happy to be over my cold, and really grateful I have no injuries or niggles! I ran early this morning, 9K in total with 3K fast in the middle. It was 6.30am when I headed out and I was thinking to myself that next week I need to get up earlier to prepare body and mind for the incredibly early start to my marathon day. The race itself starts at 6.10am and I need to be there 20mins before to settle in and catch the pre-race briefing. Knowing me I will want to be there half an hour before, so factor in a half hour walk down to the start line, I will have to leave where we are staying at 5.10am. That is after I have some breakfast….you get the picture….. Anyway, back to my run this morning…. That time of day is always interesting. As you head out, the roads are reasonably quiet, and within half an hour the amount of traffic has trebled and things have become pretty noisy. I always like to stay away from going-to-work traffic while running. People are in a hurry, focused on their day, not really paying attention very closely to non-wheeled things. There is this man, who I nearly ran over yesterday, who does not seem to share this idea. Yes, he wears a hi-viz vest over his luminous red t-shirt, but the idiot runs against the traffic, in the cycle lane, in the morning rush traffic. All this when there is a perfectly good footpath 1 metre to his right! I can only imagine what would happen if he encountered a cyclist going the correct way on a corner. On second thoughts, it may be better not to imagine as I am sure it would be quite messy. I discovered another thing about myself during my run today. It was a nice flat run from my house over to the base of The Mount, and I found myself getting tired towards the end. 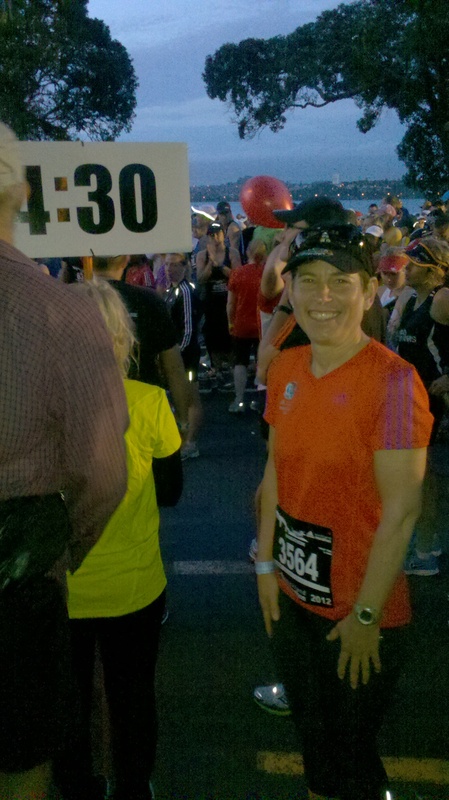 Perhaps this is when the nerves started as I was thinking to myself “I’m getting tired now, how on earth can I run 42K? ?” After I had finished and was chatting to Geoff about it I realised that towards the end of every run I do I feel tired. It happened yesterday as well, and I only ran 5K. So when I start to flag at the end of the race I will know this is normal for me and I won’t panic. This last week has been quite a challenge nutritionally though. I know I have to cut down on the carbs for a bit and up the protein, and I am so used to the way I have been eating for all these weeks that I have found it difficult. Perhaps this next week will be a bit easier. Another thing I noticed this last week was that I have been more tired than usual. Yesterday after running 5K and having my shower I decided the best place for me was on my bed, wrapped in a duvet and having a nap! So that’s what I ended up doing…. I have had an interesting week which has made me realise even more that training for a marathon makes you aware of all sorts of things going on with your body than you would ever imagine. I get regular chiropractic adjustments, and last week the cramp in my diaphragm/abs seemed to be coming from my thoracic spine area. I also go for regular massage, and so had a massage on Wednesday. Here comes the interesting bit…. I have had cramp in my abs on my last three runs and have been trying to figure out what on earth it could be, thinking something out in my spine, tight muscles maybe? And, yes, I did have these things going on, but they were not the cause of it all…. During my massage, my therapist found that my muscle above my scapula was so tight that when she worked on it, it felt like she had stabbed me in the back with a sharp knife! This particular muscle had not been causing me any problems while running so I was confused as to how it could possibly have become so tight. The answer came the next day, when I went for my run. I decided to give my planned run a miss as it was a speed-strength workout which consists of plyometric type exercises and 400m intervals, so as to give my upper back a rest. So I went for a slow 8K trot instead and discovered while doing that, that my breathing was all up the whack and I had quite literally forgotten how to breathe normally. Instead of my tummy going out on my in breath, my chest was going up, causing tension in, you guessed it, my upper back and shoulders! So I spent the rest of the run reprogramming my breath, and it required a lot of conscious thought on my behalf. I have not run since Thursday, have a short run today before 16K tomorrow, so I shall see how I go……hopefully it all settles down! There are only two weeks left until the big day!! I am feeling rather ambivalent today. I am not nervous, and neither am I excited. race day is approaching and my mood is flattish. The temptation is there to do more exercise, and yet this is not what my body needs. It needs to taper, rest and rejuvenate, to get ready for the 28th. 18 days to go…..
On Sunday I ran 25K. 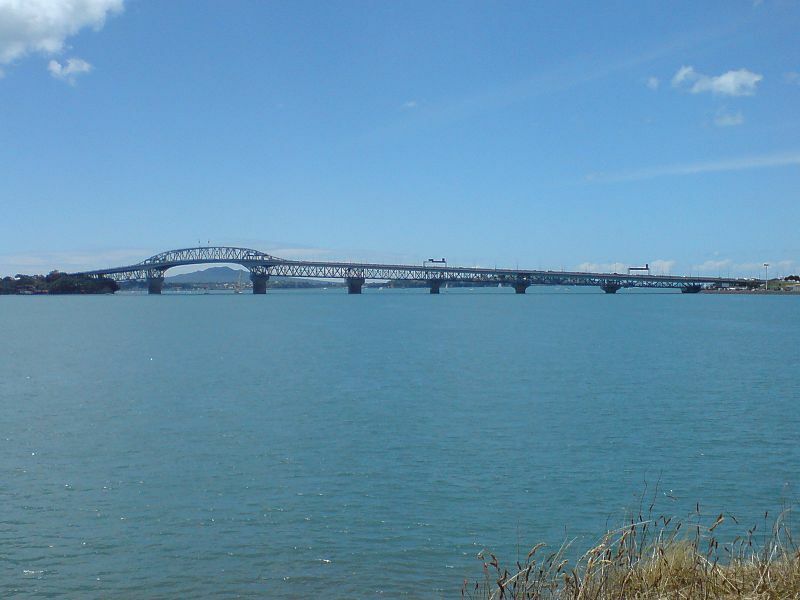 I was up in Auckland and got to see some different scenery which made the first 18K a bit more pleasant. Then I had to run uphill all the way back to our motel and I may as well have been dragging a giant concrete block with me (at least it felt like that) The wind was in my face and I had had very little sleep the night before as some other guests had decided to come home at 12.30am and talk very loudly right outside our unit for over an hour, until Geoff asked them (very politely) to be quiet. I would not have been so polite and a few choice words were brewing. I have discovered that trying to run far on very little sleep makes for a very tiring run. The funny thing is that my time wasn’t too bad, go figure. Oh well, short and sweet today as I really am in a weird head space!